Two giants of the tone world have collided! 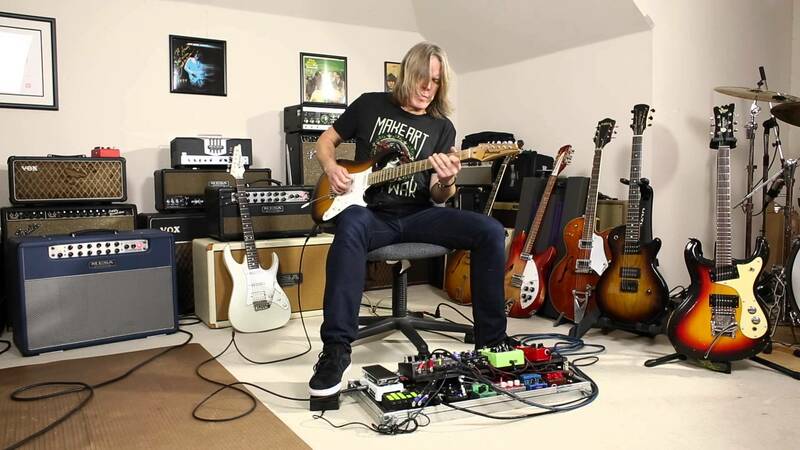 Andy Timmons and JHS have come together to create an incredible dirt box worthy of a man renown for his beautiful tone and skill to coax emotion out of any melody. 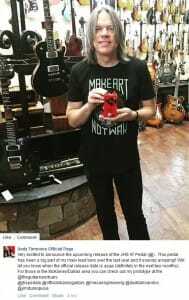 The story began a couple of years ago (2013) with Andy Timmons in his local guitar store, where he was recommended to try out the Angry Charlie by JHS. The Angry Charlie, which I imagine you’ve heard, is a best selling JHS drive pedal with a fantastic reputation regarded as one of the finest high gain dirt boxes on the market. So much so did Andy fall for this pedal, it became a valuable part of his rig – praising it as the one box which could achieve his dirt needs through the clean channel (Andy commonly known to use the warm lead channel on his amp). After striking a relationship up, JHS set about some tweaks for Andy’s personal tastes and needs – the result being the AT or ‘The @’. So the AT is a modded Angry Charlie that retains the original tone profile but with some refinements. Features include the usual knobs this time labelled Volume (master volume), Drive (amount of overdrive), EQ (tone control to sweep between dark and bright settings) and Air (presence control to tweak the high frequencies to taste). The relationship between the EQ and Air controls allows the pedal to be very versatile and work perfectly with virtually any amplifier. Alongside the controls, a 3 way switch has been added to select between 3 voicings similar to the wattage setting on an amp with power scaling. This allows you to select between what JHS refer to as a 25w mode (up), 50w mode (down) and 100w mode (middle). These different headroom settings give different compression and drive characteristics, further adding to the pedals tonal variations – the 100w setting being the punchiest and most open, 25w being squishy and creamy with 50w being somewhere in the middle. On top of the sonic versatility the pedal can also operate happily at either 9v or 18v. An excellent take on an already highly reputable drive pedal. 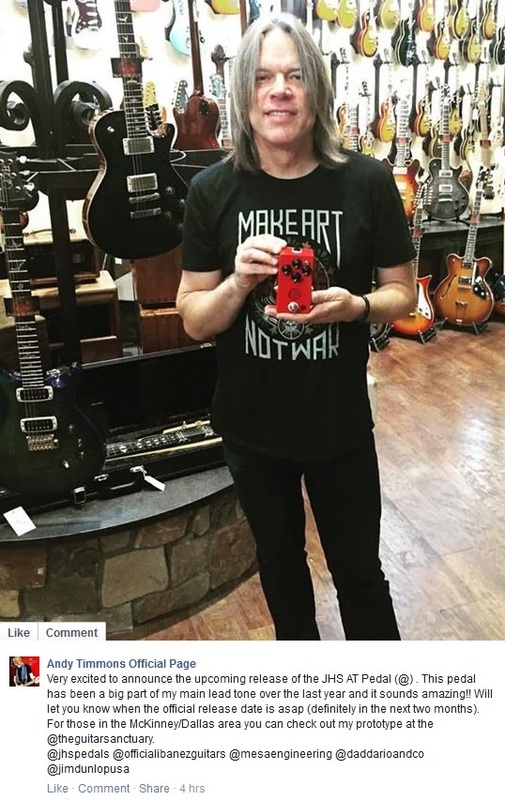 Being a huge Andy Timmons fan and avid pedal fanatic myself, after I got my hands on one of these monstrous sounding drive boxes, I took it home instantly. The flexibility of the two EQ knobs allows it to work through a variety of amps, and alongside the 3 power options it allows you to tailor the amount of openness or compression you desire. On top of that it just sounds killer. The drive is warm, but never mushy – the clarity is fantastic; there’s enough drive on tap to satisfy even the hungriest of gain demons and it grunts like a beast.